One of the core functions of the Central Eurasian Studies Society is to organize conferences that bring together the Central Eurasian scholarly community. CESS has held an annual conference hosted by universities across North America since 2000. The Annual Conference regularly features up to 70 panels and attracts approximately 300 scholars from around the globe. Our 20th Annual Conference, CESS 2019, will be held at George Washington University in Washington, D.C., from October 10-13, 2019. Travel grants for presenters at CESS 2019 are being offered. Please see the travel grants page for full details. Photo Contest – NEW for 2019! In a world where the visual is becoming an integral part of knowledge, visuals can also express scholarly knowledge. As such, for CESS 2019, we are organizing our first-ever photo contest under the title: “The Researcher and His/Her Fieldwork in Central Eurasia”. We invite scholars and journalists to submit photos of Central Eurasia (as defined by CESS) that reflect on the relationship between the researcher and the object of research and illuminate the different faces of fieldwork. Each photo should be accompanied by a short text (100 words maximum) explaining the meaning of the photo, as well as the place and year it was taken. 30 to 35 photos will be selected to be exhibited in the main hall of The George Washington University’s Elliott School of International Affairs from October 1 to October 31, 2019. The competition is open to all CESS members who have paid their membership for 2019. Photos should be of high resolution. We reserve the right to reject any photos that cannot be printed in sufficiently high quality. Registration for CESS 2019 will open in May 2019. See also: Registration fee rates for 2018. We are delighted to announce two keynote speakers at CESS 2019, Dr Mohira Suyarkulova and Dr Harsha Ram. Mohira Suyarkulova is an Associate Professor at the Department of Sociology, American University of Central Asia. She studied International Relations at the University of St Andrews, Scotland (UK) and defended her PhD thesis on statehood and sovereignty in Central Asia in 2011. Since then she has held a number of teaching and research positions in Europe and Central Asia. Dr. Suyarkulova’s research interests cover a wide range of topics. 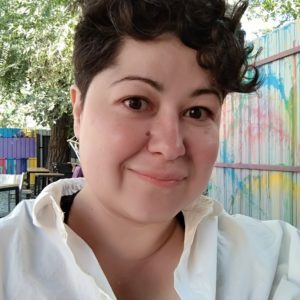 She is currently completing a project on environmental history of the Syrdarya River in Khujand, Tajikistan as well as leading a participatory action study of the sexual lives of queer people in Bishkek, Kyrgyzstan. Mohira is a queer communist and feminist, engaged in a number of initiatives on the intersection of academia, activism and art. She lives and works in Bishkek, Kyrgyzstan. Harsha Ram is Associate Professor of Slavic Languages and Literatures and Comparative Literature at the University of California, Berkeley. Dr Ram’s research interests and expertise are: Russian and European romanticism and modernism, Russian and European avant-gardes, Russian, European, Near Eastern and South Asian poetic traditions, Indian literature, Italian literature, Georgian history and literature, theories of world literature, literary theory, comparative poetics, genre theory, literary history, comparative modernisms and modernities, vernacular and high culture, cultural and political history of Russia-Eurasia and the Caucasus, postcolonial studies, theories of nationalism, imperialism and cosmopolitanism, the city and literature. The conference program will be available in online version from July 2019. A pdf version of the final program will be published here in September 2019. Pre-conference workshops will be offered again at the CESS 2019 Annual Conference. Applications to run pre-conference workshops are being accepted until March 21, 2019. Visit the pre-conference workshops page for more information and a link to the submission form. Before submitting a proposal, please view CESS’ conference rules and guidelines. The working language of the CESS Annual Conference is English. However, we will consider proposals for panels (not individual papers) in languages other than English. Please see our Conference Language Policy for details.